I might throw around the adjective "best" a little too freely, but this little recipe really earns the title of "best new drink of 2017." It might be my favorite drink that I have shared. Seriously, I have made this drink four times in the past week. I am obsessed. And I promise I'm not saying that just because it is pink, although I do adore this color. This drink is all about the syrups. Yes, it does require making two different syrups, but it is so worth the little extra effort. Both syrups can also be made in advance for super easy assembly at parties or for a quick, post-work pick-me-up. The first syrup is a vanilla bean syrup that I would like to pour on anything and everything because it is so delicious and fragrant. It is like a vanilla bean smacked you in the face, and that potency really works in our favor because the vanilla carries through even though we will only be adding a little to each drink. 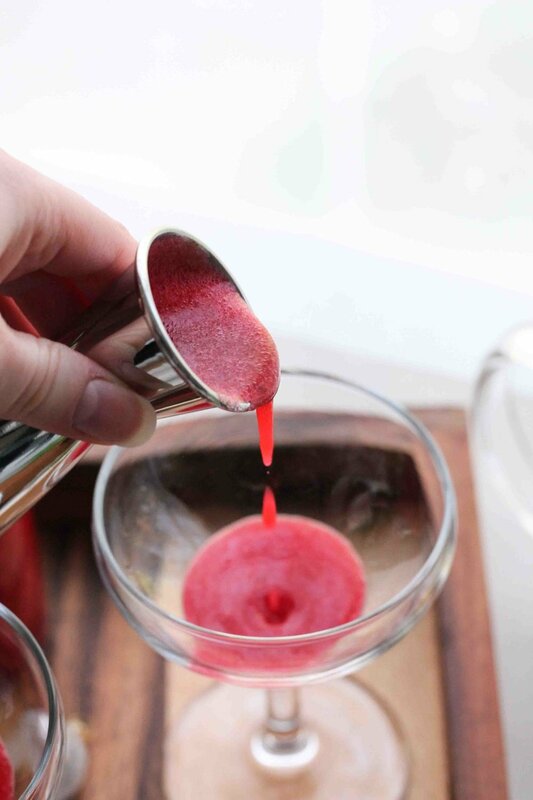 The next syrup is a cranberry syrup which is barely sweetened and adds a wonderful punch of acidity that balances out the sweet vanilla syrup. You can adjust the ratios as you see fit, but I went with an ounce of each the syrups and one of fresh lime juice for a little extra tartness. You can combine all of that in a cocktail shaker, or just make the drinks one at a time and give it a good stir. If you take your drinks really cold (I do!) then I'd go for the shaker and take the chance to chill it down with a handful of ice. Fill the glasses to the rim with sparkling water for some added bubbles and to even out all of the flavors. If you are feeling a little fancy you can whip up some of these gorgeous, sugared cranberry stirrers in about fifteen minutes and really impress your guests. I could not decide whether I would share this drink for Christmas or New Year's because it really would be perfect for both, but the color was just so festive that I decided I would gift it to you now and give us all two chances to make it. Place sugar in a 2-quart saucepan. Use a fork to press the scraped vanilla bean along with the pod into the sugar, then cover with water. Cook the syrup over medium high heat, stirring often, until the sugar has dissolved. Simmer for 5 minutes, then remove from heat and allow to cool to room temperature. Combine all ingredients in a 2-quart saucepan and bring to a boil over medium high heat. Boil for five minutes, then remove from heat and transfer the mixture to a blender. Blend until very smooth, then strain through a fine mesh strainer and refrigerate until ready to use. This syrup will keep for up to a week. Place 1 cup of the granulated sugar into a shallow bowl. Combine remaining 1/2 cup granulated sugar and water in a 2-quart saucepan and set over medium high heat. Cook, stirring frequently, until the sugar has dissolved, then bring to a boil. Boil for about 2 minutes; until the syrup has thickened just slightly, then toss in cranberries. Cook for one minute, then remove the pan from the heat and use a slotted spoon to remove the berries from the syrup, tossing them into the bowl of sugar. Slide two or three cranberries onto one end of a toothpick or cocktail stirrer and re-coat with the sugar as needed. Lay the coated cranberries out onto a sheet of parchment paper and allow them to dry for about 5 minutes. Cook's Note: The assembly instructions are for a single drink, but you can easily multiply the recipe to serve as many or as few as you'd like. The cranberry syrup will last up to a week in the refrigerator but the vanilla syrup is best if used within a day. *Cook's Note: I like my drinks on the sweeter side, but you may wish to start with half of an ounce and increase based on your personal taste. Combine syrups and lime juice in a cocktail shaker with a handful of ice and shake thoroughly. Pour into a 5 1/2-ounce cocktail glass and fill to the top with sparkling water. Serve immediately. Garnish with sugared cranberry stirrers, if desired. Enjoy!